Immigrants entering the United States should know about the tests and taxation laws. How are nonresident aliens taxed? 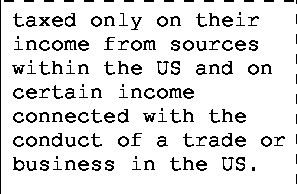 taxed only on their income from sources within the US and on certain income connected with the conduct of a trade or business in the US. What are the two residency tests? Green Card Test and Substantial presence test. Green Card Test a taxpayer is a lawful permanent resident of the US any time during the tax year. 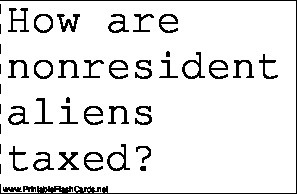 They may choose to be treated as a resident alien for an entire calendar year. What days do professional athletes count for the substantial presence test? athletes exclude only the days in which they actually competed in the sports event, but do not exclude days used for practice, travel or promotional events. When is a taxpayer considered a nonresident alien for tax purposes? if the taxpayer does not meet the green card test or substantial presence test. What portion of income is taxable for nonresident aliens? 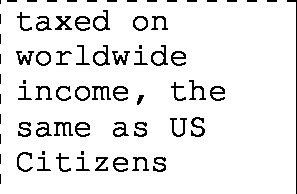 taxed only on their US source income. When may a nonresident alien who does not meet the substantial presence test or green card test still elect to be treated as a resident for tax purposes? if he is married to a US citizen or resident. An election to be treated as a resident for tax purposes only may be elected if: 1. at the end of the year, 1 spouse is a nonresident alien and the other is a citizen or resident, AND 2. both spouses agree to file a joint return and to treat the nonresident alien as resident alien for the entire tax year. What is classified as an international student? anyone who is temporarily in the US on a F, J, M or Q visa. When is a taxpayer considered a duel status alien? when he has been a resident alien and a nonresident alien in the same tax year. What part of income is taxed for a nonresident alien? taxed only on his US source income.